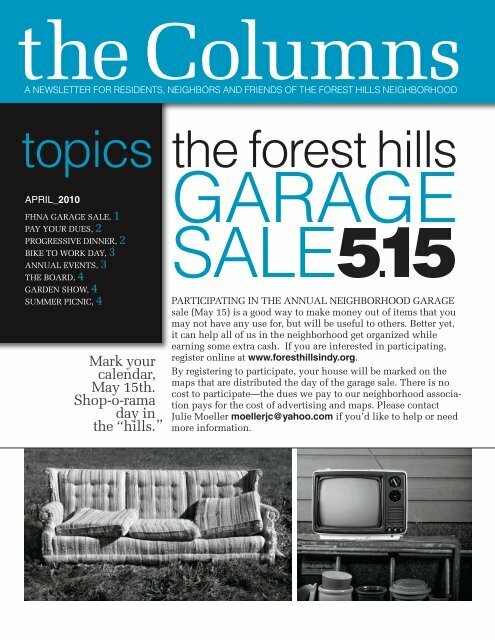 the ColumnsA NEWSLETTER FOR RESIDENTS, NEIGHBORS AND FRIENDS OF THE FOREST HILLS NEIGHBORHOODtopicsAPRIL_2010FHNA GARAGE SALE, 1PAY YOUR DUES, 2PROGRESSIVE DINNER, 2BIKE TO WORK DAY, 3ANNUAL EVENTS, 3THE BOARD, 4GARDEN SHOW, 4SUMMER PICNIC, 4Mark yourcalendar,May 15th.Shop-o-ramaday inthe “hills.”the forest hillsGARAGESALE5.15PARTICIPATING IN THE ANNUAL NEIGHBORHOOD GARAGEsale (May 15) is a good way to make money out of items that youmay not have any use for, but will be useful to others.  Better yet,it can help all of us in the neighborhood get organized whileearning some extra cash. If you are interested in participating,register online at www.foresthillsindy.org.By registering to participate, your house will be marked on themaps that are distributed the day of the garage sale. There is nocost to participate—the dues we pay to our neighborhood associationpays for the cost of advertising and maps. Please contactJulie Moeller moellerjc@yahoo.com if you’d like to help or needmore information.